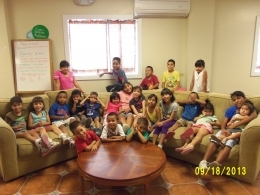 As you know, we have been praying that the Lord would send more children to Sonshine Hacienda. We were confident that God had a plan and that we needed to be patient and wait on HIM. So, the Lord is beginning to increase our "lambs". On September 11, we received a call from DIF, (our local Child Services Agency). They asked us if we would take five children from a family whose mother was drug addicted. After learning of their situation, we agreed to take all five of the children. Angela is 8 years old, Sofia, 5; Fernanda, 2; Carlos, 7; and Sabastian, 4. Then the following day, we again got a call from DIF explaining that they had a young girl who had been picked up because she was living with an older woman who was caring for her because her mother was drug addicted and unable to care for her. This older woman was not a relative and therefore could not legally care for the child. Therefore, we came to receive Mari Terri, who is 11 years old. So 6 new children were added to our flock...at least for now. As parents go through rehab, they have the opportunity to get a "second chance" with their children. It is now in the hands of DIF and our Lord. Please keep these children in your prayers. Their lives have not been easy.Praise the Lord that we have the opportunity to show them God's love and grace. Lorenzo was our only birthday child in the month of August....and he loved every moment of being in the lime light!! 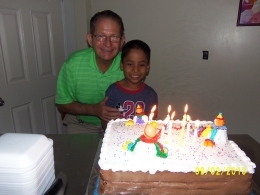 Lorenzo came to us in May of 2012 as one of our original 6 children that we received. He came to us from Mexicali and had been in the DIF system for quite a while before coming to Sonshine Hacienda. Lorenzo is a Special Needs child and attends a special school here in San Felipe. He celebrated his 9th birthday this August. He had been looking forward to his birthday celebration for weeks. Lorenzo has a wonderful smile and he enjoys life to the fullest. He has a special friend at school. Her name is Wendy. Of course, Papa Gary and Papa Alvaro likes to tease him about her all the time. August 19th the children were back to the routine of rising early (with the chickens) and getting ready for school. They have to get up early in order to get dressed for school and of course the girls all have to get their hair "beautified". They then have morning devotions together and breakfast before boarding the Sonshine bus to leave for school. 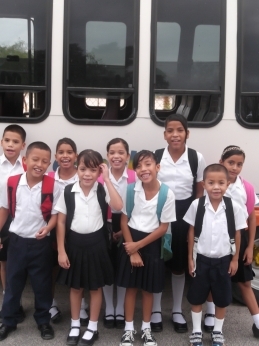 As they left to board the bus the first day, the children were all carrying new backpacks which had new supplies of pencils, erasers, glue, etc.. Thanks to generous donors, we had to buy very few school supplies this year. The primary grades leave for school at 8:00 am and the "Kinder" kids go to school at 9:00 am. All children are picked up at 12:00 pm. The children were ready to return to school...to new adventures and old friends. As for our Dorm Mothers...well, I saw some smiles on their faces as they waved good-bye to the children as they left on the bus. They had a few hours of a well deserved respite! 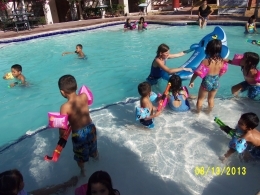 What a fantastic time time was had by all at our "Back to School Pool Party"! We loaded up the Sonshine bus with food, drink, water wings, towels and sun block and off we went....oh, and the kids and adults too!! We went to a fantastic pool out in La Hacienda. There is a set of Condo's there with a perfect pool for children. The pool is not over 4 feet deep and has terraces to sit on in the pool. Even the smallest of our children felt comfortable in the water. Of course, we still had an adult assigned to every child. We played in the water for hours while Papa Rafa, our Cook, was preparing BBQ chicken tacos and all the "fixins"...delicious! My Grandson Jonah had purchased a huge inflatable shark that was the hit of the party. Way to go Jonah!! The kids had such fun. We hope to be invited back again soon. Every child gets a dental exam and cleaning after they arrive at Sonshine.